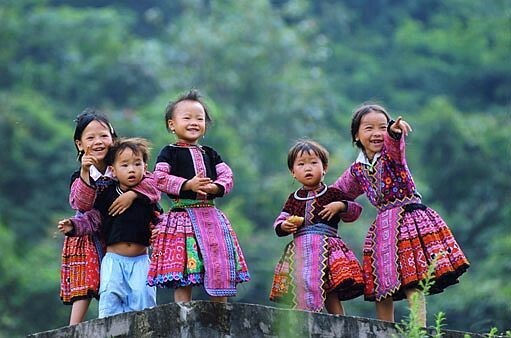 Even you have very little idea about Sapa – an attractive area of northern Vietnam, you probably feel something similar when the word “Sapa brocade” is spoken out loud. Vietnam Typical Tours is willing to share all the information about this favorite souvenir that you never forget to buy some if you are there. 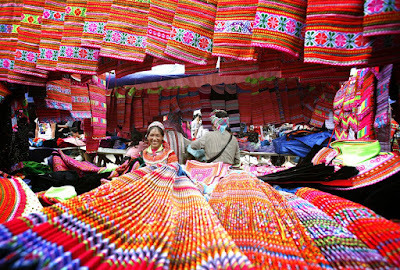 Visitors to Sapa are not only excited about majestic and pristine sightseeings, gentle people as well as hyperactive children, but also interested in many unique handicraft products including colorful brocade pieces. The ingenuity of H’mong ethnic women in sewing is the most important criteria for men to select their wife. As that fact, when women were girls, they were taught to know how to make a perfect clothes or fabric products. 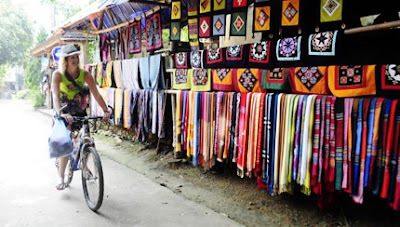 Formerly, women just made clothes for domestic use, but now, they are able to trade these products. Addition to trading trend, handmade Chinese products also expand to Vietnam which can make visitors confused to distinguish between Sapa brocade and Chinese one. Therefore, it must be worthy for someone if they are lucky enough to have a real knitted scarf rather than embroidered one. There is a priceless tip for you if you want to buy the best brocade piece. H'mong and Dao ethnic’s goods are very solid, well defined lines, thick thread, background color and downs fired, they often use a some basic colors such as black, white , red, blue. Stocking embroidery Chinese goods by the other hand are loose, sparse, fine thread, vicious. They often use too many colorful threads that may not really highlight.